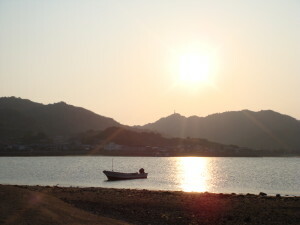 Innoshima, a small island in Hiroshima Prefecture, floats in the Seto Inland Sea. Despite its size and remote location, it has a distinct and robust cultural identity, which is slowly slipping away. In 2006, Innoshima City was merged with Onomichi City on the mainland Japan and several other islands in the Seto Inland Sea, losing its autonomy as an independent city. It became “Onomichi,” a city separated from the island by several bridges and thousands of years of cultivating its own way of life. In an instant, Innoshima became island lost to the greater governmental sweep of amalgamations, swallowed up by the bigger neighboring town. Although less than 11 miles separated, the cultural differences and ways of life stretch beyond the bridges. I moved to Innoshima about 8 months after the merge. Already at that point you could feel the weight of the this change and loss, a somber mourning for the past and strange taste toward the future. It was like a new manager had stepped in, not knowing what any of the other jobs were all about, making decisions and changes without understanding the product. It is hard to really find the identity of Innoshima. On a map, it is a small dot between other small dots. Zoom out far enough, and it disappears. Zoom in close enough, and you still have a disguised understanding. Several years ago I was searching for my old apartment on Google Maps and noticed that you could only zoom so far compared to other places. There was no street view, no way to see in. This made me curious as to why I could not see more. Why was this place so hidden. Japan is hard to get a street view, but major cities and towns have more cartophgraphical documentation than Innoshima. Over the last 5 years, the resolution and zoom have gotten better. But there is so much missing from the map, that someone perusing through would miss the true heart of the Island. Since I left in 2008, many locations have since closed and gave way for new places that I have yet to visit. And so many historical places that are going nowhere forever, still remain intact as they have for thousands of years. This Mapumentary exists to bring Innoshima’s identity to the forefront, sharing the stories and images of those who have experienced it first hand. 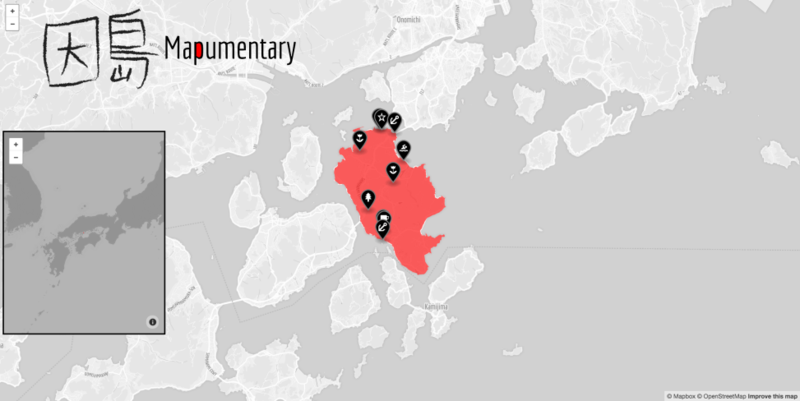 It is a map to show you what you don’t see, mapping the negative space of Japan. The Map places Innoshima in the center, as the central focus, while everything else around it fades out to nothing. The small, embedded map visually depicts how quickly it is to lose Innoshima in a map view. The larger map offers photos and memories from around the Island. I hope to continue to add stories and fill in the blanks of this cultural landmark, bringing it to life in a way that does not exist yet.